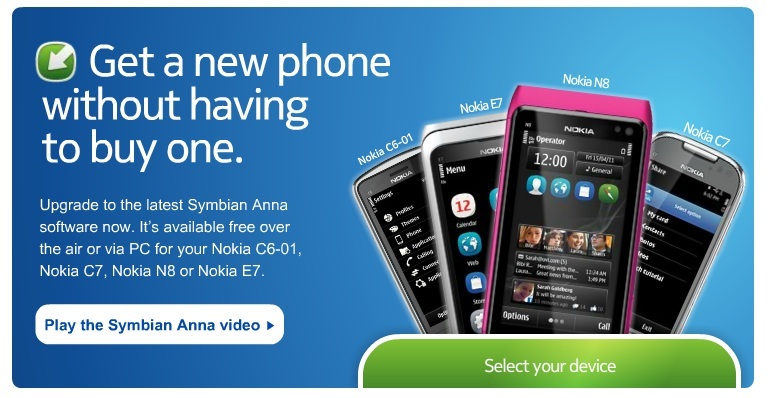 Nokia New Zealand: “Symbian Anna available”? Nokia New Zealand have a banner saying the “Upgrade to the latest Symbian Anna software now. It’s available free over the air or via PC for your Nokia C6-01, C7, N8 or E7”. It’s not “will be available” or “update when it’s available”. It says upgrade now. My Ovi Suite says nothing is available yet – though updates don’t roll out simultaneously everywhere. What we do know is that Anna is due for all S^3 devices this month (August 2011). A little premature from Nokia NZ? Or is it coming ‘soon’ soon? Like a non-Nokia perception of soon. Thanks Senthil for the tip. « Android now accounts for nearly half of every smartphone shipped- Why that can’t last.